The Pediatric Care Unit at Corona Regional Medical Center provides pediatric inpatient hospital care and an environment that helps make them safe and comfortable while they heal. The team of pediatric nurses, nursing assistants and board-certified pediatric physicians at Corona Regional have been specially trained to take care of your child if he or she requires hospitalization. The team works with dieticians, respiratory therapists, physical therapists, occupational therapists, speech therapists, social workers and other healthcare professionals to ensure that your child receives high quality medical care. Our pediatric unit has a playroom with toys, Xbox and Wii video game consoles, movies and tablets to help them feel at home. We help your child feel comfortable by moving them to a separate treatment room, rather than treating him or her in their hospital room, to ensure that they see their hospital room as a safe and secure place. Parents are essential members of their child's healthcare team. When parents and their child arrive at the hospital, parents are given a blue Partner-in-Care armband. The armband gives parents 24-hour access to their child (some restrictions may apply), participation in care, interpretation services and help with their physical, emotional and spiritual needs. In addition, parents are encouraged to stay overnight in the sleeper chair at their child’s bedside. We work closely with the Corona Norco School District when children stay with us for an extended period of time. We partner with your child’s teachers and work with them to get your child his or her homework if your child is able to complete it. We also help in scheduling make-up classes for your child. Asthma — This inflammation of the airway is the most common, chronic and potentially serious condition in children. Pediatric allergist-immunologists provide high-quality asthma care for your child. Bone Fractures — About 15 percent of all injuries in children are fracture injuries. These require special care in children, as a child’s bones are still growing. Emergency medicine and pediatric orthopedic specialists provide care for your child’s bone fracture to help ensure it heals correctly. Bronchitis (RSV) — A form of bronchitis, respiratory syncytial virus (RSV) is a common virus of the airway that causes cold-like symptoms in adults and healthy children. It can be more serious in young babies. Pediatric infectious disease and other specialists on the medical staff work to provide high quality care in children and babies who have RSV. Cardiac Monitoring — Pediatric cardiac specialists at the hospital can use a range of monitoring techniques for your child’s heart condition, including electrocardiogram (which records the electric activity of your child’s heart), Holter monitoring (a wearable device) and others. Concussion Monitoring — Pediatric physicians at Corona Regional will monitor your child in the first 24 to 48 hours after an initial head injury to check for signs that could indicate a more serious injury. Gastroenteritis (Dehydration) — Viruses are the most common cause of gastroenteritis, which causes diarrhea, vomiting and other potentially serious symptoms in children. Pediatric specialists at the hospital focus on preventing dehydration (fluid loss). 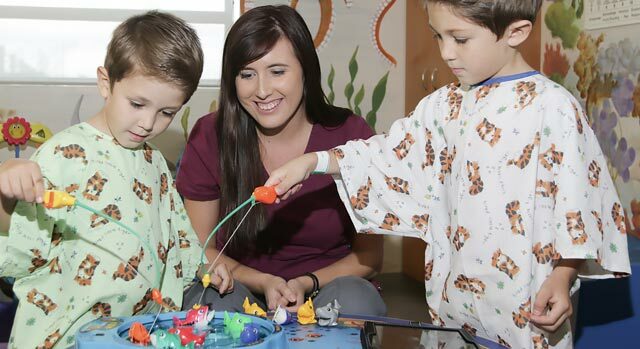 General Surgery — If your child needs surgery, surgeons at Corona Regional are specially trained to provide high quality preoperative, operative and postoperative management of their medical conditions. Hyperbilirubinemia — In this condition, which is jaundice* in newborns, there is too much of a substance called bilirubin in the baby’s blood. (Bilirubin is produced by the breakdown of old red blood cells and hemoglobin, a protein that carries oxygen to the blood.) Usually, jaundice goes away within a week or two after birth, but in some cases it doesn’t, which can cause serious side effects. Meningitis — This condition is an acute inflammation of the protective membranes covering the brain and spinal cord and is potentially life-threatening. Pediatric infectious disease specialists at the hospital provide advanced medical care for babies or children who have meningitis. Pneumonia — This lung infection is a potentially serious condition in children, with 40 percent of cases requiring hospitalization. Pediatric infectious disease specialists at Corona Regional provide high quality care if your child has pneumonia. *Jaundice, while not uncommon in newborns, can lead to permanent and disabling health consequences when not diagnosed and treated promptly. Contact your pediatrician immediately if you notice yellowing of your infant's skin or eyes. To find a doctor who's right for you, call our FREE physician referral service at 800-882-4362 or request a referral online.